THPBlog: Sierra Pacific Industries to log near Nevada City and Scotts Flat Reservoir. Sierra Pacific Industries to log near Nevada City and Scotts Flat Reservoir. 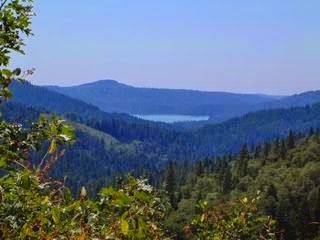 This THP is about 7 miles NE of Nevada City, CA near Highway 20 and Scotts Flat Reservoir at an elevation of 3,400 to 4,000 feet elevation. The THP area is in an historic hydraulic mining area that drains towards the Yuba River. Sierra Pacific Industries is planning a tractor and cable logging operation in ponderosa pine, Douglas fir, incense cedar, sugar pine and white fir forests. They are claiming the need to sanitation salvage log trees up to 140 years old due to various rust diseases and mistletoe presence, some of which are normal at mid to high elevations. Road construction is proposed across an unstable cutbank area within section 32. Although somewhat vague with information; the THP reports a fisher sighting nearby, 5 goshawk sightings nearby, 2 historic red fox sightings nearby, 1 osprey sighting nearby, 1 marten sighting nearby, a great blue heron sighting, and 10 foothill yellow legged frog sightings nearby. Six California Spotted Owl territories were reported within .2mi to 1 mi from THP units. More information is available on the THP Tracking Center website.